Thanks to Neil Gaiman for being a good sport and linking to my last posting, in which I claimed (among other things) that all his books were written by bees. I usually chug along with about 50 hits a day; that day I suddenly got 7000 hits and my server went foom! I’m thankful for the brief spotlight. And now for The Strange Ship: Part II! What am I talking about? 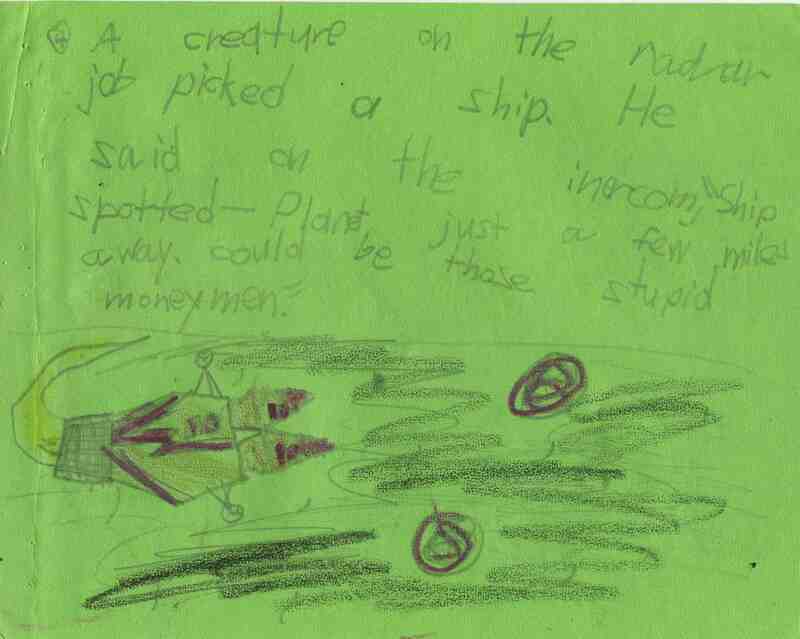 Well, as a lark, back in November I posted The Strange Ship, the first book I ever wrote (I was seven years old). I mentioned I had written a sequel. 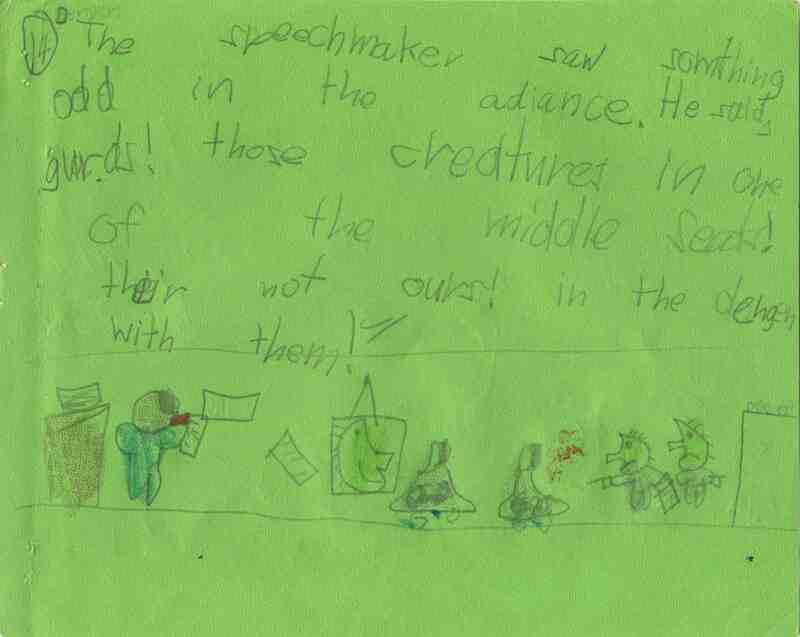 Some of the students in Mrs. Vivian’s fifth grade class asked me to put it online. My pleasure! 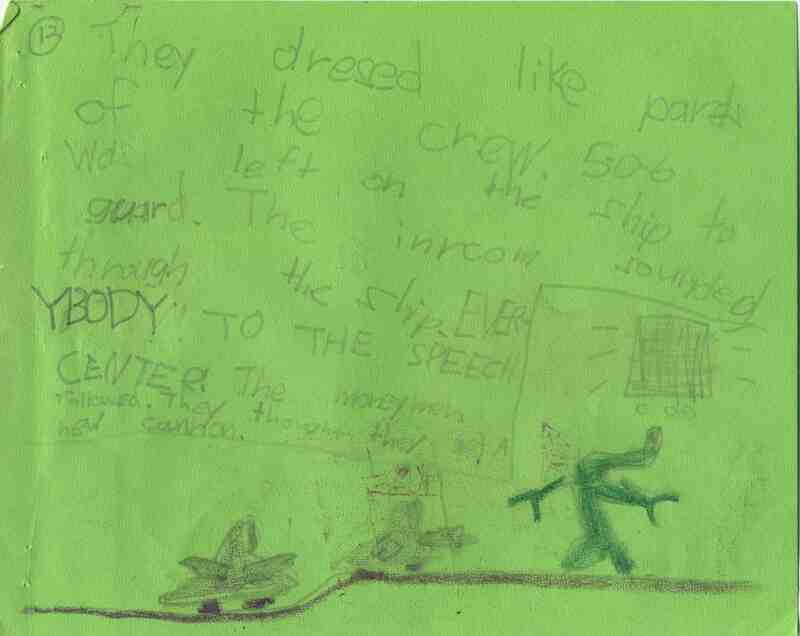 In The Strange Ship, two nameless space explorers called “moneymen” and their trusty droid 5-0-6 stumbled upon a strange ship full of monsters (including the giants Carziperes, Diploziperes, and Zarzit). 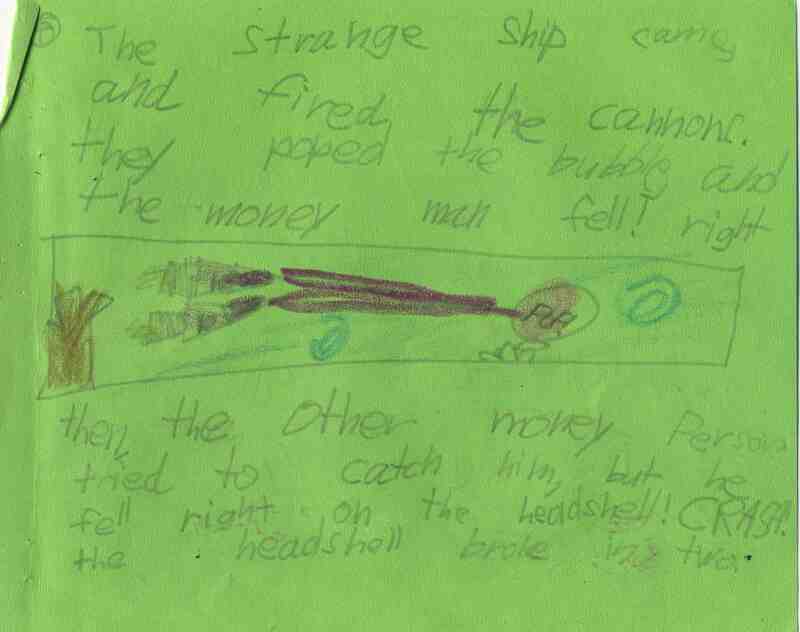 The moneymen then proceeded to blow up the ship by making all the monsters simultaneously sneeze. Clearly a sequel was required, to tie up all those loose ends. So let me take you back to March 13, 1981—almost exactly 28 years ago—and The Strange Ship: Part II. However, I must warn you—the last couple pages are, tragically, missing! The story breaks off right in the middle of the climax! But America, my carelessness is your opportunity. I propose a contest. 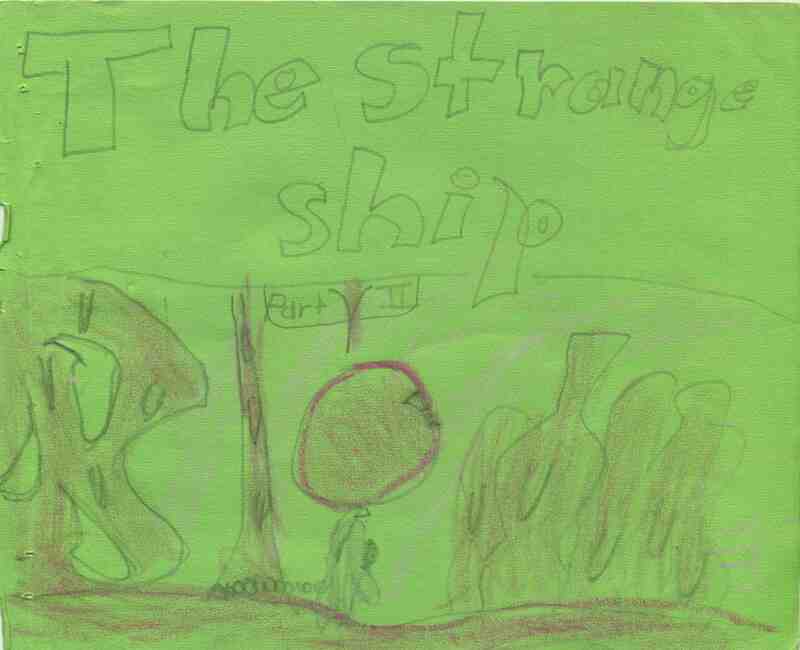 Write YOUR OWN ending to The Strange Ship: Part II (with illustrations, please!) and send it to me! Let’s make the deadline April 15, 2009. 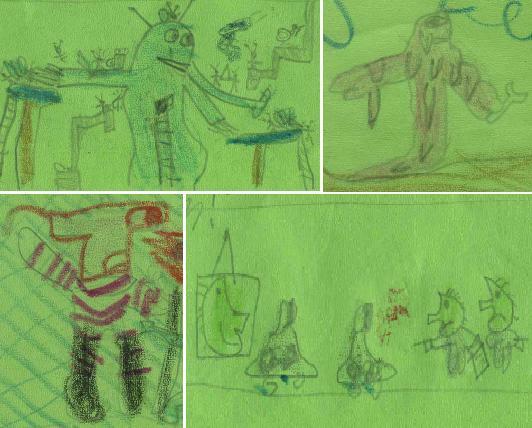 I’ll post the new endings right here on this blog, and there will be prizes! 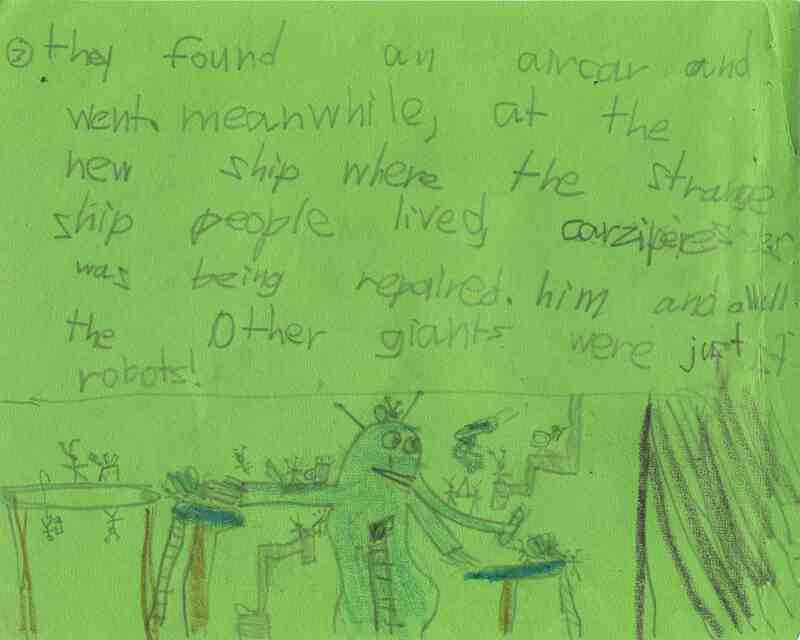 Anyway, without further ado: The Strange Ship: Part II! To make it easier to read, I’ve typed the text below each page and tidied up the spelling. 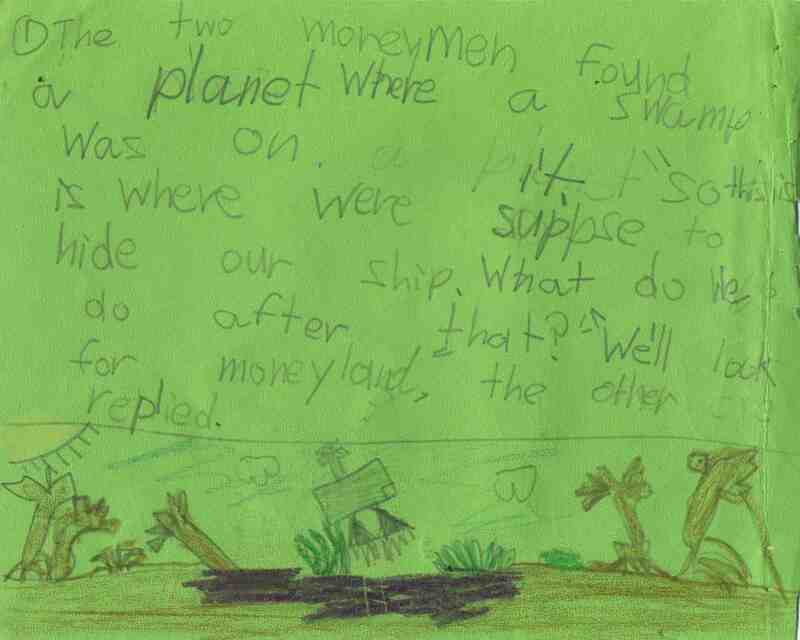 The two moneymen found a planet where a swamp was on it. “So this is where we’re supposed to hide our ship. 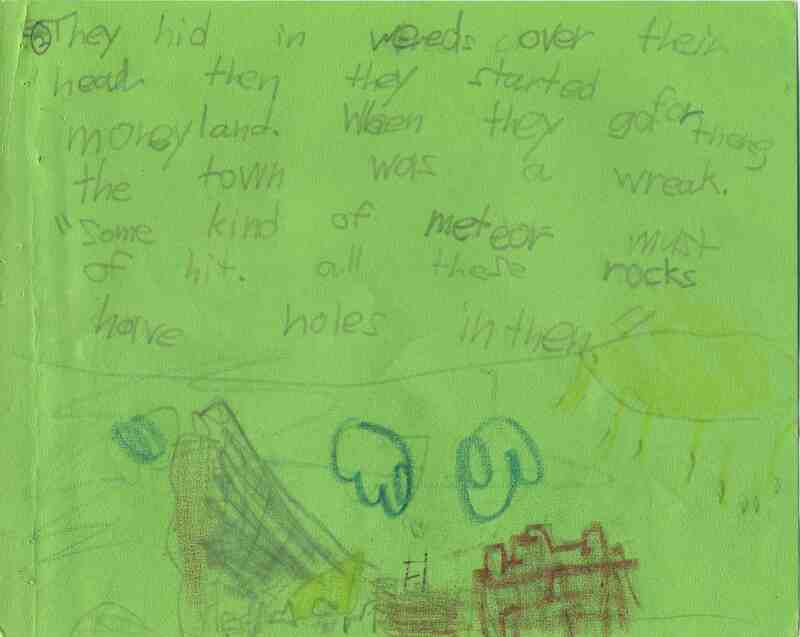 What do we do after that?” “We’ll look for Moneyland,” the other replied. They found an aircar and went. Meanwhile, at the new ship where the strange ship people lived, Carziperes was being repaired. Him and all the other giants where just robots! 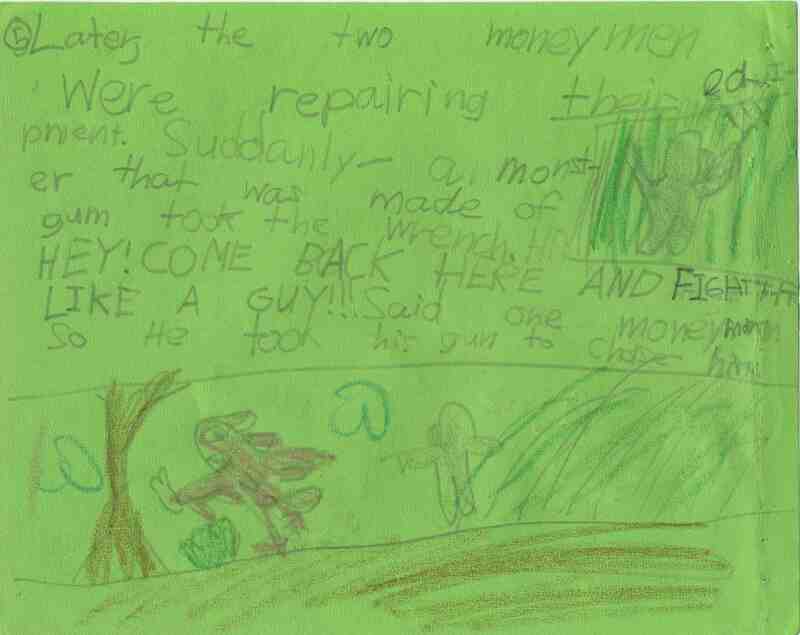 Later, the two moneymen were repairing their equipment. Suddenly a monster that was made of gum took the wrench. “HEY! COME BACK HERE AND FIGHT LIKE A GUY!” said one moneyman. So he took his gun to chase him. 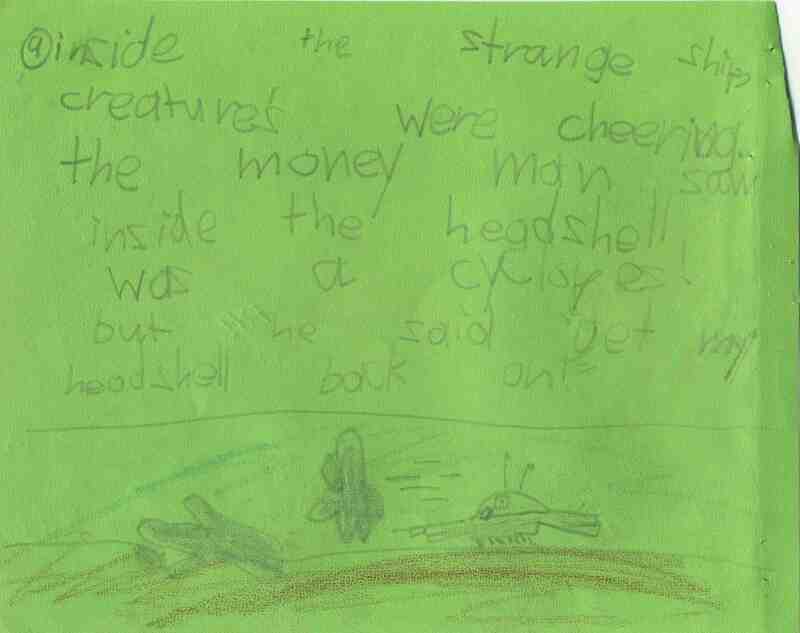 He chased him into a gum-made cave. “Wow,” thought the moneyperson. 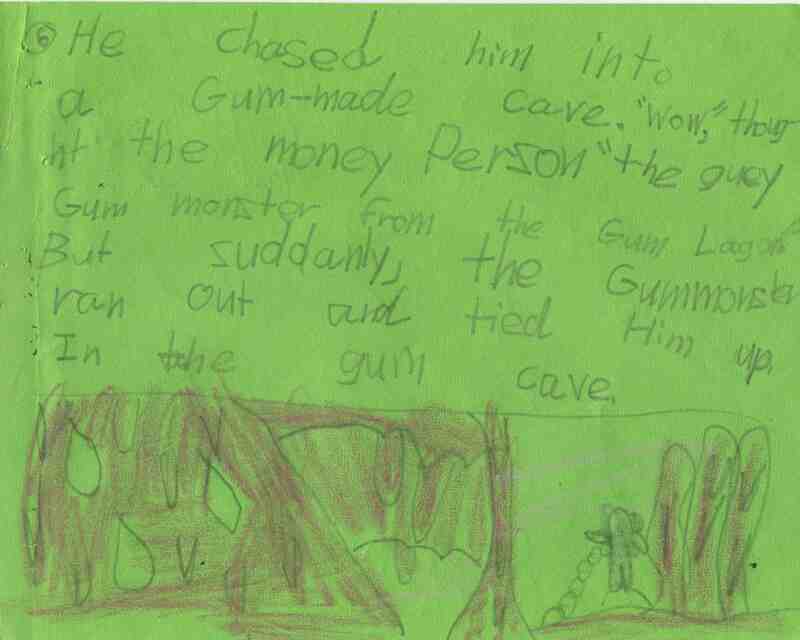 “The gooey gum monster from the Gum Lagoon.” But suddenly, the gum monster ran out and tied him up in the gum cave. The money person thought of a way he could get out. He would blow a bubble big enough so he would float up. 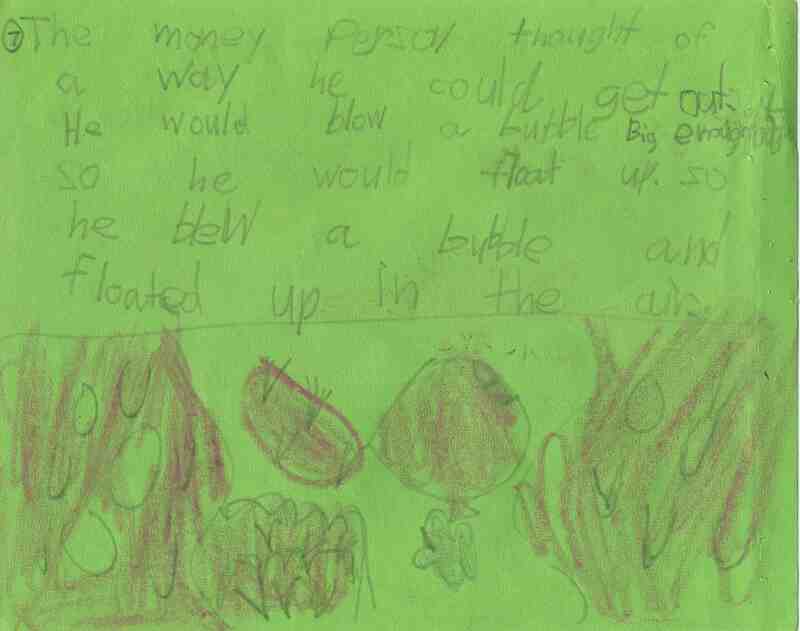 So he blew a bubble and floated up in the air. The strange ship came and fired the cannons. They popped the bubble, and the moneyman fell! Right then, the other money person tried to catch him. But he fell right on the headshell! CRASH! The headshell broke in two. 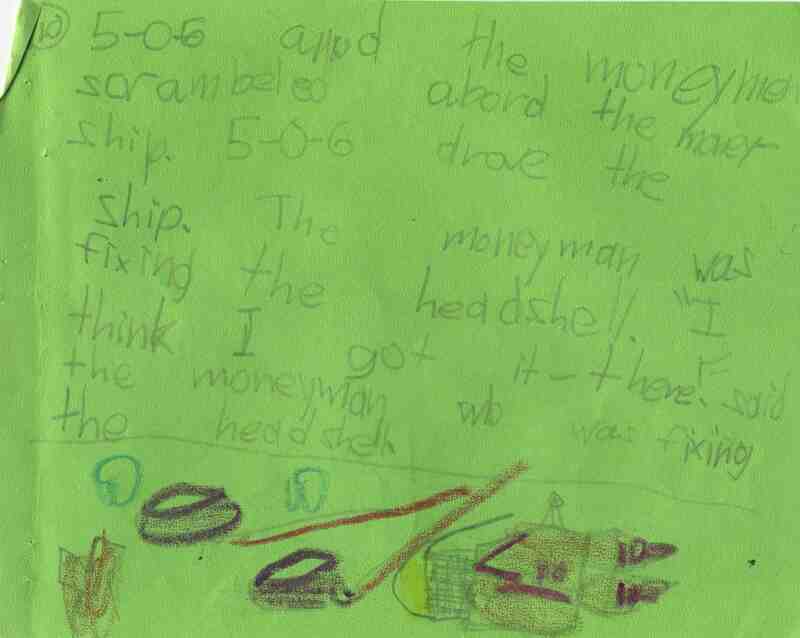 5-0-6 and the moneymen scrambled aboard the moneyship. 5-0-6 drove the ship. The moneyman was fixing the headshell. “I think I got it—there!” said the moneyman who was fixing the headshell. 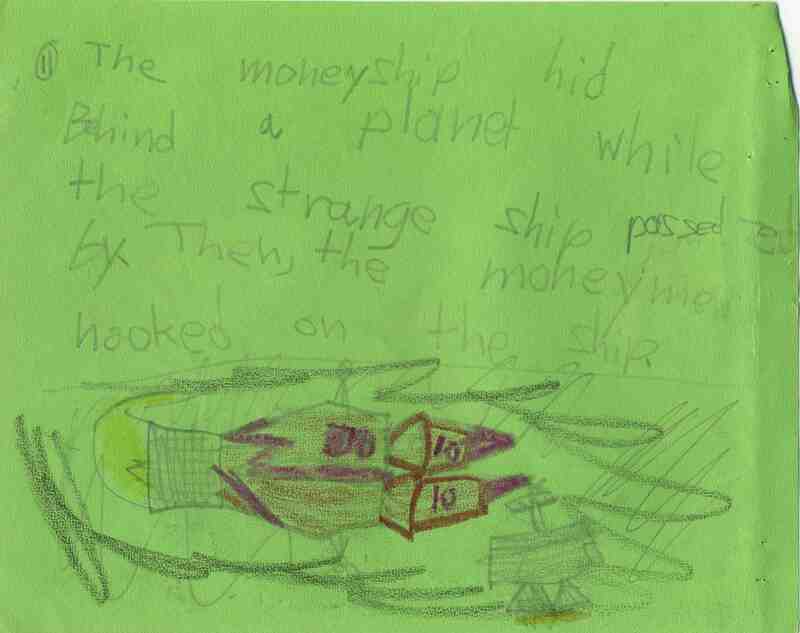 The moneyship hid behind a planet while the strange ship passed by. Then the moneymen hooked on the ship. They dressed like parts of the crew. 5-0-6 was left on the ship to guard. The intercom sounded through the ship. 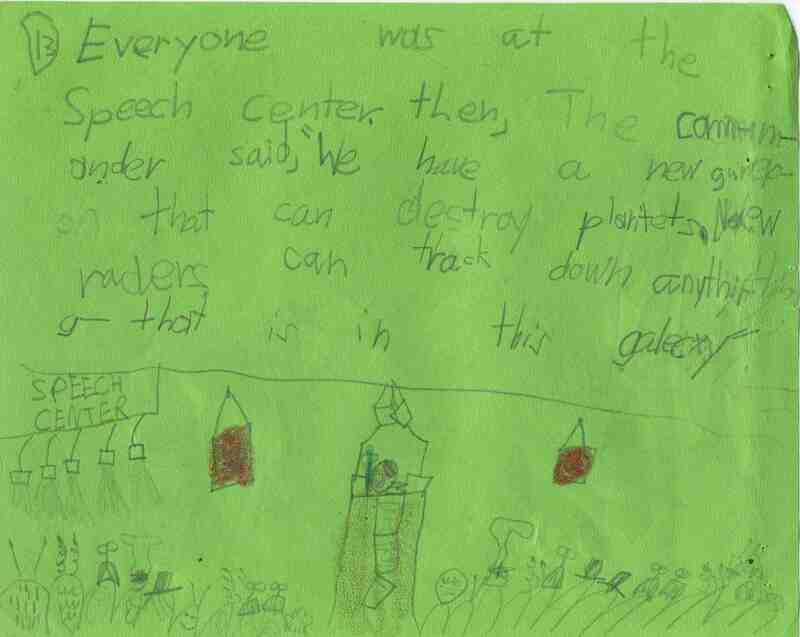 “EVERYBODY TO THE SPEECH CENTER!” The moneymen followed. They thought they got a new cannon. 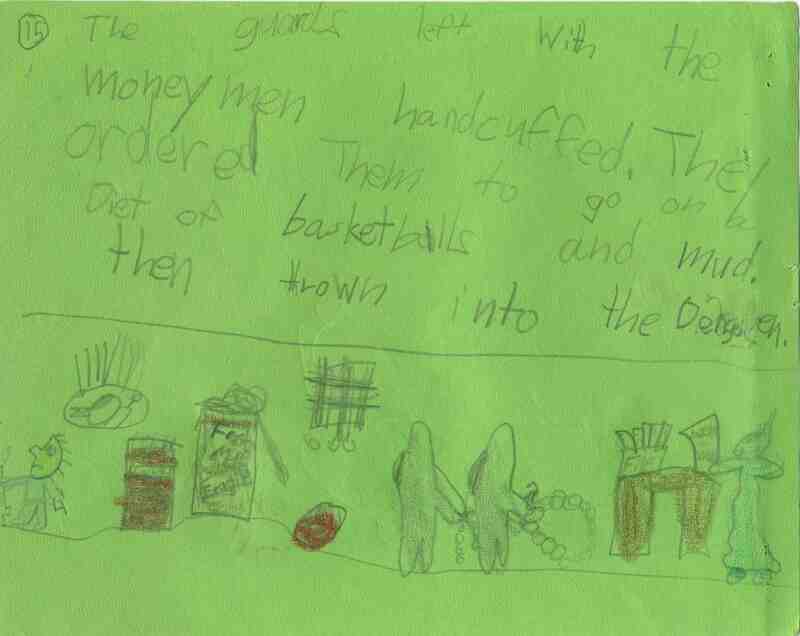 The guards left with the moneymen handcuffed. They ordered them to go on a diet of basketballs and mud. Then thrown into the dungeon. 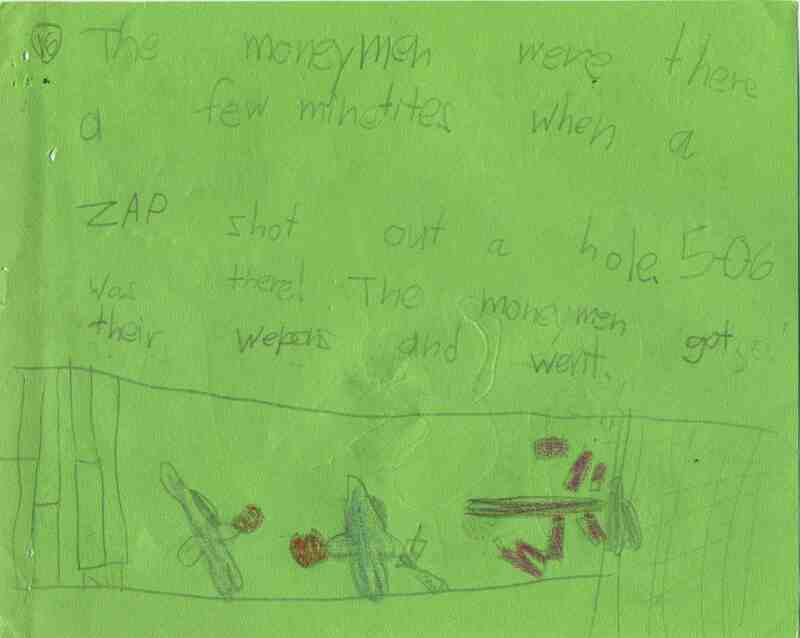 The moneymen were there a few minutes when a ZAP shot out a hole. 5-0-6 was there! The moneymen got their weapons and went. 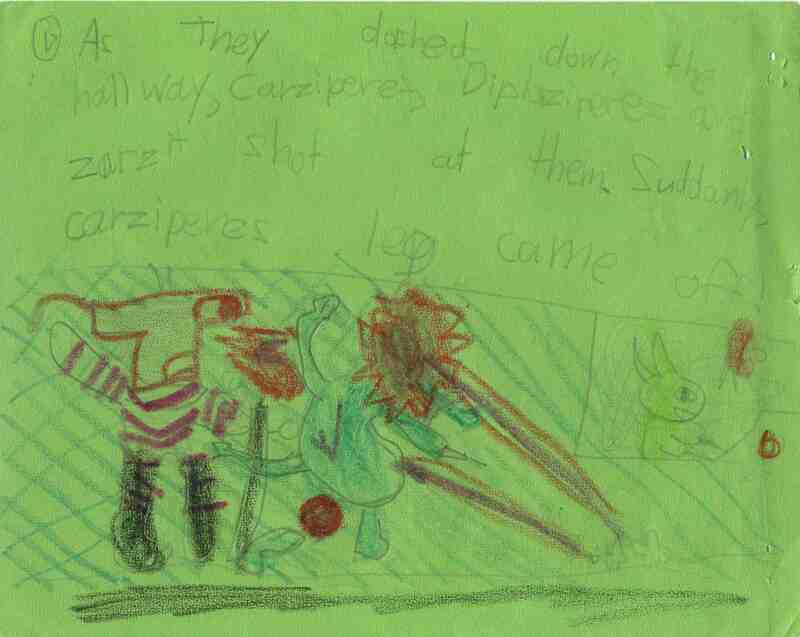 As they dashed down the hallway, Carziperes, Diploziperes, and Zarzit shot at them. Suddenly, Carziperes’ leg came off! 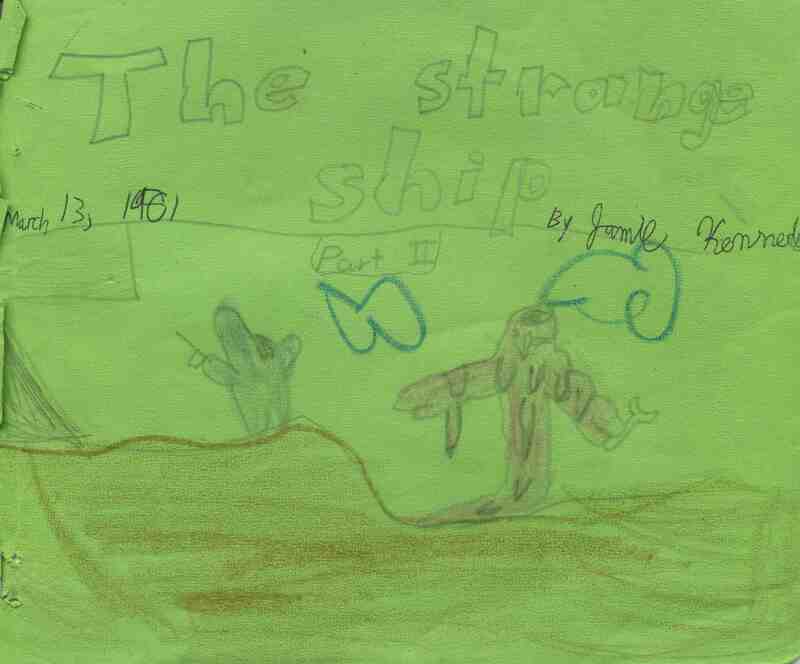 Anyway, if you feel up to it, please write and draw an ending for The Strange Ship: Part II and send it to me! I promise a whimsical prize.